Beat SCAD Conference 2018 – book your place now! 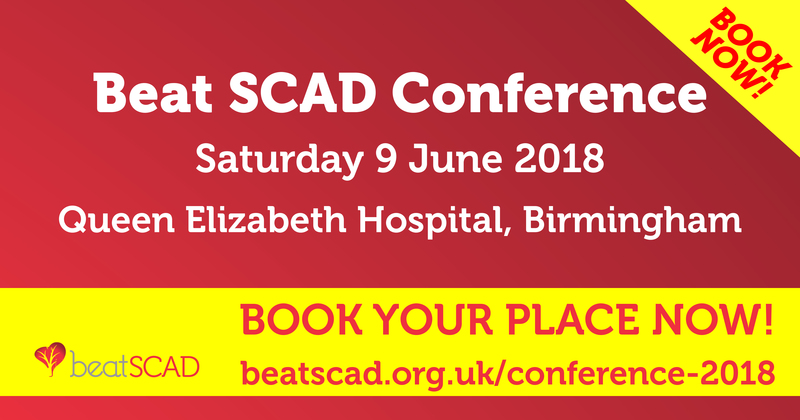 Registration is now open for the Beat SCAD Conference on Saturday 9 June at the Queen Elizabeth Hospital, Birmingham. SCAD researchers and experts Dr David Adlam, Dr Abi Al-Hussaini and Dr Alice Wood will all be giving presentations and updating us on the research, and it’s also a fantastic opportunity to meet other SCAD patients and their families, so it’s set to be a great day. Click here for details, including delegate fee, venue, hotels and directions. You will need to complete the registration form and you will then be directed to our online shop to pay the delegate fee(s). On a cold Monday morning at the end of 2017, Beat SCAD Trustee Karen Rockell and Sarah Coombes attended a day-long meeting of consultant midwives held at the Royal College of Obstetricians and Gynaecologists in London. Karen and Sarah had been asked to do a presentation about SCAD during the day, to raise awareness and discuss midwives’ questions about the condition. There are currently 89 consultant midwives and of the 21 present at the meeting, three had heard of SCAD, one having had a SCAD patient in her hospital 26 weeks into her pregnancy. They listened closely to the presentation and had lots of questions. There was a discussion about the value of telling pregnant women about SCAD. Karen advised that Beat SCAD had steered away from doing this as SCAD is uncommon and pregnant women have enough to cope with during pregnancy. The midwives advocated a general notice for midwives about not ignoring chest pain, jaw or shoulder ache or prolonged symptoms of ‘heartburn’ that don’t respond to medication as a guide. 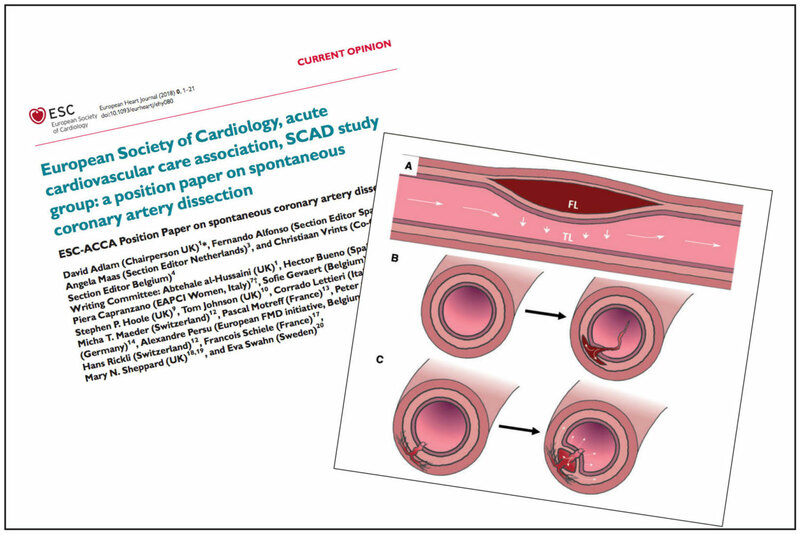 Beat SCAD emphasised the need for midwives to insist on troponin tests being carried out when such symptoms were evidenced. Awareness was undoubtedly raised among this important group of midwifery professionals, who will talk about SCAD with their colleagues and hopefully share the materials that Beat SCAD provided. Implementing the ‘Maternity Transformation Programme’, which came out of the ‘Better Births’ Report of 2016 and the Secretary of State for Health’s stated ambition to: halve the number of stillbirths, neonatal and maternal deaths and brain injuries by 2030. The problem of data collection/sharing accurately and the future role of smart phone apps in helping midwives diagnose and monitor Mums and babies. Human rights for pregnant women – in particular, the work of UK charity Birthrights http://www.birthrights.org.uk. The forum also noted that the European Convention on Human Rights remains in place in the UK after Brexit as it is not part of the EU infrastructure. Ceasarian sections – Currently a woman has no absolute right in law to insist on a c-section. The forum expects that in 10 years’ time this will have changed and that women will have the right to choose an elective c-section should they wish to do so. The new CEO of the Royal College of Midwives (RCM), Gill Walton, attended the meeting and spoke about her new role and the ‘big conversations’ that she wanted to have with everyone in the midwifery profession ‘from the bottom up’ during the early part of 2018 about what the RCM will come to look like over the next five years. She said that ‘safe care and individualised care’ is the aim and stressed that the consultant midwife group is the conduit for sharing best practice. The Consultant Midwife role was created early in the noughties. While consultant midwives do not control budgets or get involved in day-to-day management issues, their role is to provide clinical excellence at the bedside, working closely with departmental management. They act as a conduit for the expertise of senior midwives, spreading knowledge of best practice among all midwives and focusing on improving provision of services. Beat SCAD has also been asked to make further presentations at individual hospitals (Epsom and St Hellier, Chelsea and Westminster) as part of their CPD (Continuing Professional Development) programmes, which is a great step forward. All in all it was a very useful day – lots of information shared and lots of new leads created for our P-SCAD (pregnancy-related SCAD) programme!